Nicole Fitzsimons was born bright and early on the 10th June 1988, perhaps that’s why she has always been a cheerful morning person. What struck you about her first were her large and most beautiful blue eyes. Nicole had a wonderful, carefree and engaging childhood going to preschool right across the road from us then to St Finbars, Sans Souci to year 6 – when she was elected school captain. Nicole then continued on to St Vincents at Potts Point for high school where she continued her studies to year 10. Behind the scenes of her schooling, her talent and passion for dancing was beginning to blossom, amongst all the little girls lined up in the ballet classes, Nicole always stood out with her beautiful little feet. By around her mid teens it seemed her talent for dance and ballet would take her to the top if she wished – she had won many competitions along the way, with her mother Julie supporting and taking her everywhere, including in 2005 to The Royal Ballet to compete against girls from all over the world. For Year 11 Nicole transferred to Newtown Performing Arts High School where along the way she collected another marvellous group of friends. But she needed more to advance her talents so she joined the New Zealand School of Ballet in Wellington at the age of 16 – she was so excited to have her career underway. Rugby League was of course a very big part of Nicole’s life and she flew home from New Zealand for several matches during the year. But throughout the year doubts appeared about her being a ballerina for life – there was so much more she wanted to achieve. So she returned home, completed her HSC by correspondence then attended ED5, a performing arts school in Strathfield. Next came her big break when selected to dance at Disneyland in Tokyo for a year. She used to say “I’m living the dream – I’m gliding across the stage as Snow White when Cinderella and Prince Charming Waltz by” – she got to play all the Disney characters on stage and all of her family were able to visit and see her perform there. When she returned from Disney, Nicole became serious about building a career in the media, particularly in sports journalism. Again she studied by correspondence to complete a degree in media and communications at Griffiths University, where she graduated posthumously with a Distinction average in December 2012. Nicole is more than a pretty face, particularly where passion drives her mind. Meanwhile family, Rugby League, working full time and the real loves of her life – Jamie and her puppy Cooper, occupied her time. Nicole and Jamie were dedicated and fun-loving soul-mates, and after recently renovating their home they were soon planning to marry and settle down with children in the near future. Early in 2012, Nicole earned the dream career start as the Personal Assistant for the Executive Producer for Channel 9’s ‘The Footy Show’. Now Nicole was able to combine her love of rugby league and her passion for the media with the most wonderful people who work at Channel 9. Nicole developed very special relationships with her colleagues at Channel 9, who supported and mentored her to fulfil her full potential. It it is clear she could have built a wonderful career in sports journalism. Naturally, Nicole would have loved to eventually present in front of the camera and with the chance to start doing so in the foreseeable future. Nicole became a much-loved member of Channel 9 who helped organize a memorial for her where over 2, 500 people attended to celebrate a shining star who was taken far too soon. At the same time as working on The Footy Show, Nicole was developing her broadcasting career with Hawkesbury Radio who cover the NSW Rugby League Cup each weekend. Nicole was the sideline eye, giving match reports, interviewing players and coaches as well as giving her upbeat and incisive commentary – running around the field in her head phones and with mike in hand, beating the other broadcasters to the “big” interviews. 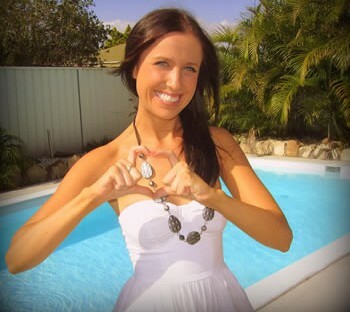 Nicole describes the day her beloved St George Dragons won the 2010 premiership as ‘the day my life became complete’. In honour of this milestone, Nicole got a tattoo “One Life One Team” – for Nicole “team” is not just a footy term, it’s about Family, it’s about Friends, it’s about the extensive and often virtual community she created around her – all of which will live on forever through the establishment of The Nicole Fitzsimons Foundation. Life was all falling perfectly into place for Nicole, but she left this world to be an angel on the highest possible note. Nicole always has been, and always will be, an important part of the Fitzsimons Family as they now dedicate their time to honour Nicole’s legacy of helping to make a difference in the lives of others.